In 1991, the late Esther McCormick collected many stories she had heard and collected over the years since the publication of Sunbury’s Part in History which she wrote in 1966. As Sunbury celebrated its 175th birthday, Esther’s collection was published under the title, “Chapters in Community History.” Miss McCormick often told me she was not a historian because she did not do original research. Even so she was a folklorist and collected others' recollections which in many cases are the only history we have. Although telephones would become popular at the turn of the twentieth century, many people still kept in touch in parks like Olentangy Park, Minerva Park and Sunbury’s Blue Grass Grove. John McFarland brought land across the northern part of Sunbury. He added an addition to the Sunbury Burying Grounds know as the McFarland Addition. His land along High Street and south of Croton Road (now Hartford Road) had a grove of very old trees which were perhaps virgin forest. One hundred years ago the only homes on this stretch of High Street were homes of Milton Utley who lived at 113 High Street, Douglas Gorsuch at 108 High Street and Doc Armstrong at 207 High Street. 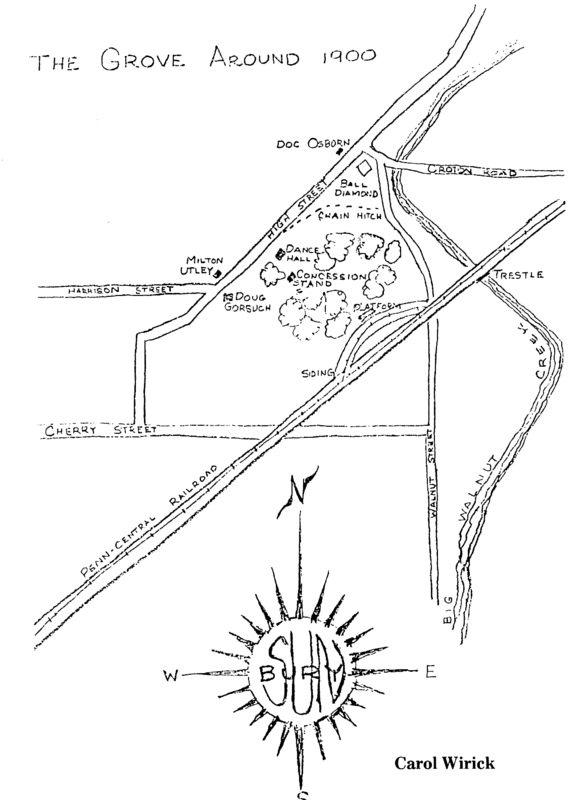 The entire acreage east of High Street from Harrison Street to Croton Road, and bounded in the rear by the old creek road and the railroad compromised the Grove. The only part not covered by trees was a narrow strip south of Croton Road joining High Street which made a great ball diamond. The former furniture store rented by Big Walnut Friends Who Share is located there. McCormich wrote, “Here men and boys played baseball. A chain hitching rack passing through cement posts separated the cleared section from the woods. Old timers remembered when the entire length of hitching rack would be filled with horses and their rigs. “A dance hall stood in the end of the trees and behind it was a concession stand. Here the most popular item was lemonade – made in a barrel. How many lemons would it take to make a barrel of lemonade. “The enterprising young salesmen advertised their ware with this chant – Lemonade! Lemonade! Made in the shade! A nickel a glass – with a fly in it! Mr. McFarland was well liked by young people. “Boys would “help” when help was needed – clearing up after storms or a big gathering. Of course work of this type was fun work, not to be confused with ‘work’ work that young people did for their parents. And when John McFarland paid them a nickle or dime for their efforts, boys considered themselves fortunate. “Not just Sunbury residents used the park. 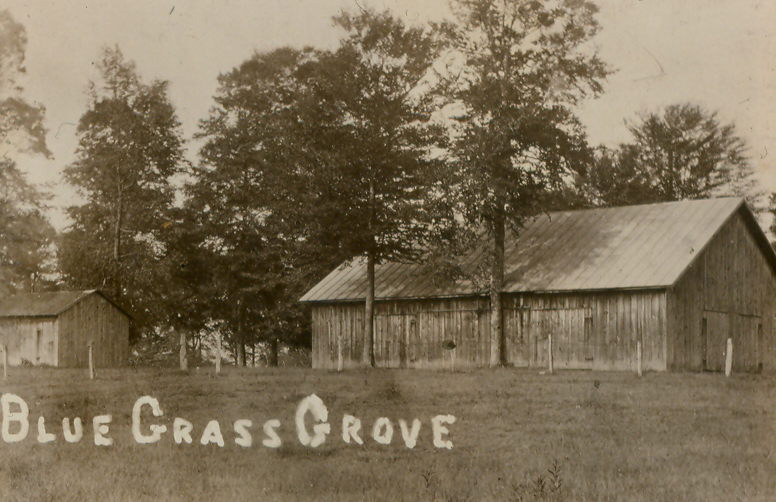 The Grove was well known. City people, especially the Irish and German people of Columbus chartered trains, sometimes with 10 or 12 coaches which unloaded their passengers at a platform near the trestle. Here the train waited on a siding until the people returned to Columbus in the evening. These ethnic groups always made Sunbury passers-by welcome also. “The ending of the Grove is sad. Shortly after World War I a tornado devastated the whole area. Richard Paul told of standing near a window and watching the trees as the tumbled to the ground. “The area was cleared and sold into lots. After World War II the back portion of the Grove housed the Big Walnut Swimming Pool (now V.F.W. ), noted McCormick. This is just one of any stories in McCormick’s collection. The book is in Comunity Library and for sale in the Myers Inn Gift Shop for $20. 2016 has drawn to a close so this ends the series of columns on Sunbury’s history for its Bicentennial. Copies of all the articles are on the internet at http://BigWalnutHistory.org along with hundreds of other vignettes of the past in the Big Walnut community. McCormick, Esther, compiler. Chapters in Community History of the Big Walnut Area. The Spahr and Glenn Co., 225 East Spring Street, Columbus, Ohio. 1991.